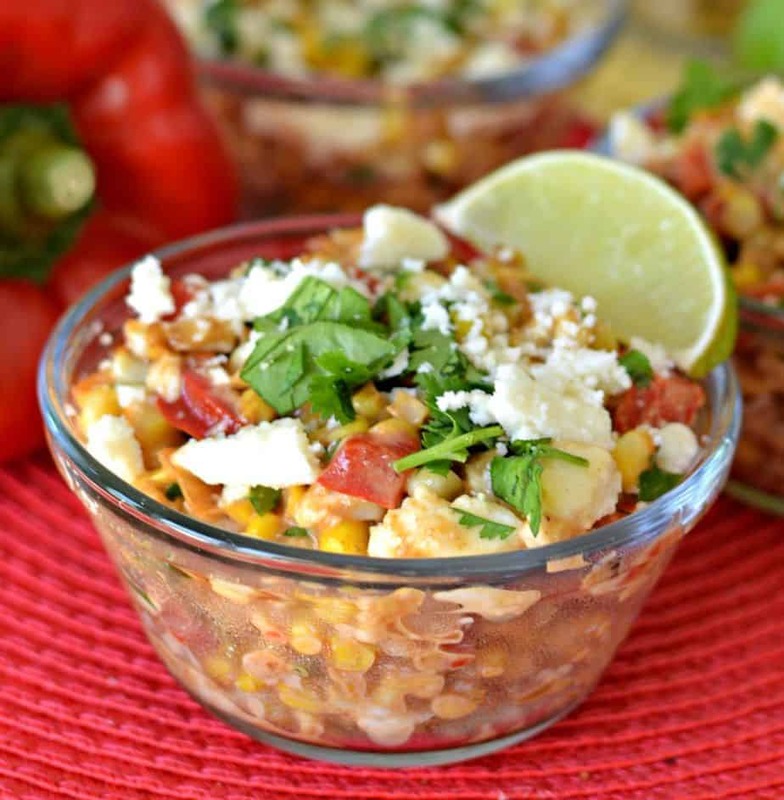 Easy Mexican Street Corn Salad brings the great flavors of sweet corn, onion and red pepper together in a creamy base with the perfect combination of mild spices. It is topped with Cotija cheese and fresh cilantro. Add a couple tablespoons of finely minced jalapeno if a little more heat is desired. Wow Cinco de Mayo is just around the corner. Can you believe how fast the year is zipping by? I can hardly believe that the kids are almost out of school and that we will be on to the summer schedule soon. Are you doing anything special for Cinco de Mayo? 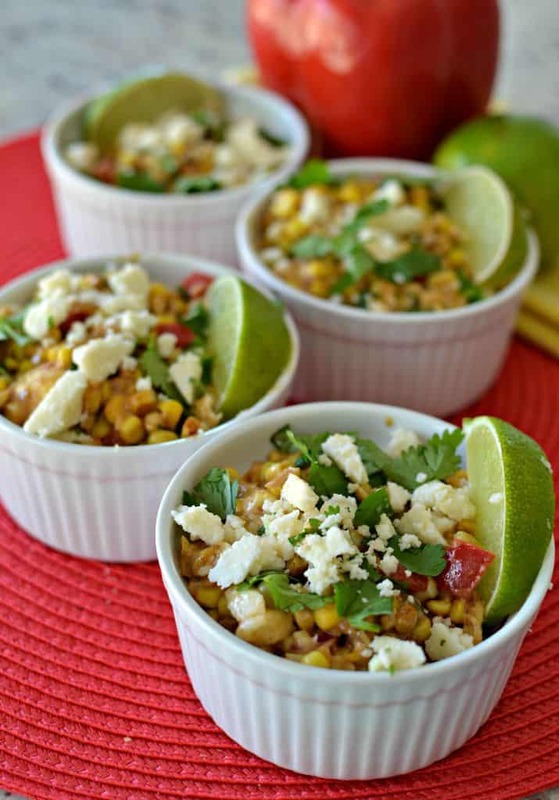 This delectable Easy Mexican Street Corn Salad can be prepared in about twenty minutes. It can be served hot or at room temperature and it a perfect complement to all your summer barbecues and picnic plans. We are huge corn lovers over here. Well we do live in the Midwest and we are privy to a lot of really sweet corn. 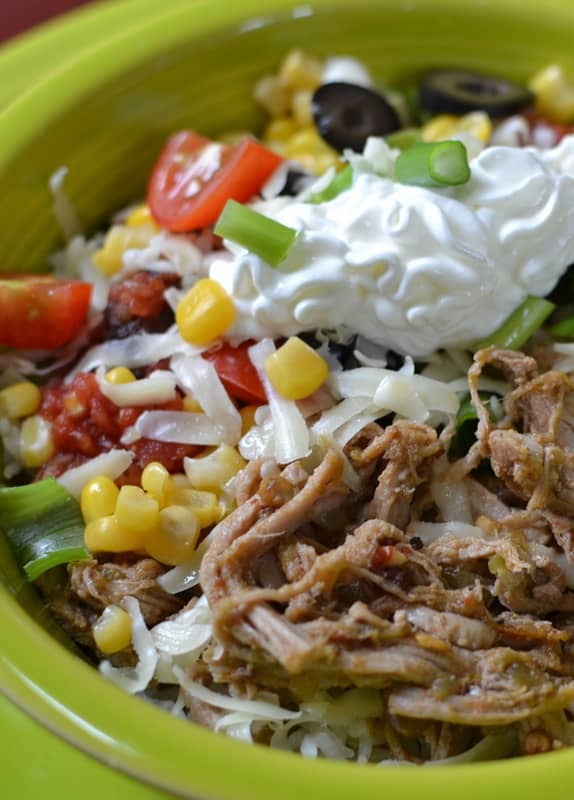 Do you have a favorite corn recipe? Here are a few of our favorite recipes!! Some are my recipes and some are fellow blogger favorites. 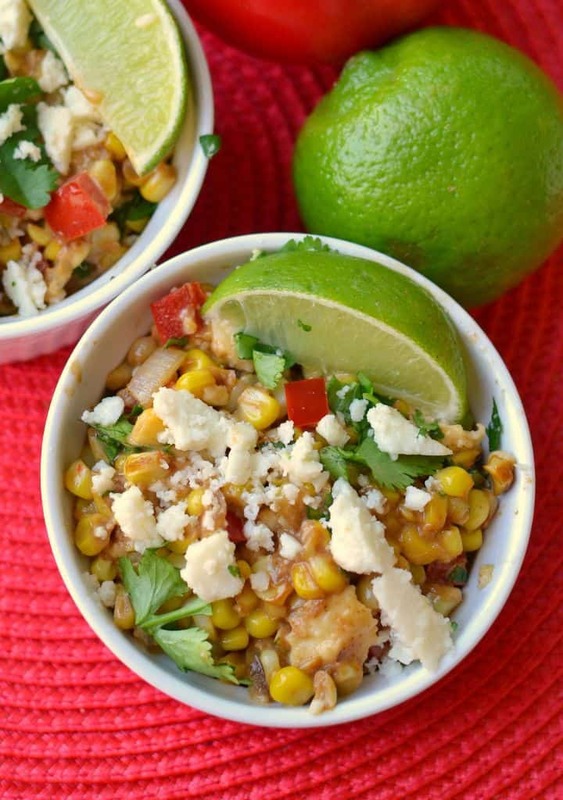 This delectable Easy Mexican Street Corn Salad has many of the same great flavors of Mexican street corn without the hassles of grilling the corn, basting the corn and making sure the cheese stays on the corn and that it is served right away. This dish is all prepared in the same skillet. The corn is perfect every time and not overcooked. The serving time is more flexible. It can be served right out of the skillet but it also tastes yummy at room temperature and even chilled. Please make sure you refrigerate any leftover (if you have any) because it does have mayo and cheese in it!! 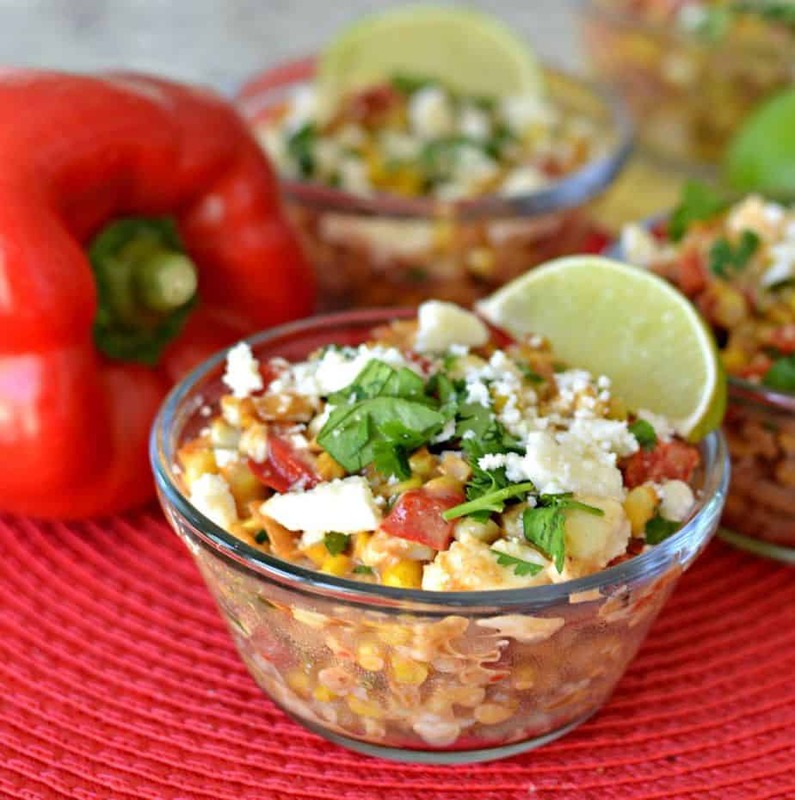 So if Cinco de Mayo is looming, if you like tasty side dishes or you just LOVE CORN put this scrumptious Easy Mexican Street Corn Salad on your to try list today. In large skillet heat oil over medium heat. Add corn and cook for 8 minutes stirring occasionally. Add onions and peppers and cook for additional 5 minutes or until the onions and peppers have started to soften and the corn is lightly browned. Keep stirring occasionally. Reduce heat to low and add garlic; cook for 1 minute. Add lime juice and scrape to deglaze pan. Remove from heat and stir in mayo, paprika, cayenne, cumin, salt, 1/4 cup cojita and 1/4 cup cilantro. Before serving top with remaining cotija and cilantro. Other delicious Mexican recipes you will love!! I have not made this yet but as soon as I get fresh corn I will serve it at my next BBQ. Its a different spin of the oil and vinegar recipes you usually see. Thanks! My pleasure. It is so good!! Thank you!! I live within a few minutes of the Mexican border, I have had Mexican Street corn, but I have never made it. 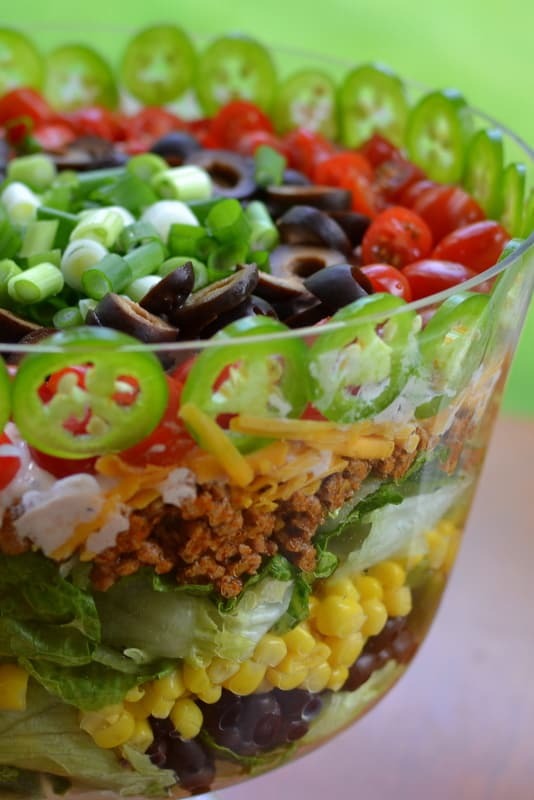 This recipe makes it look so easy to make and so yummy!!! The pleasure is all mine. Thanks so much for leaving such a kind message.